An App ID can easily be obtained and is used in environments with low-security requirements, such as in a testing environment. A SignalingToken adds security and is used in environments with high-security requirements, such as in a production environment. An App Certificate is enabled for the sole purpose of generating a SignalingToken and cannot be used alone. Once an App Certificate is enabled, you can only use the SignalingToken for authentication. After signing up at Dashboard, multiple projects can be created. Each project will be assigned a unique App ID. Anyone with your App ID can use it on any Agora SDK. Hence, it is prudent to safeguard the App IDs. To switch your App ID, you must first call the destroy method to destroy the current instance. 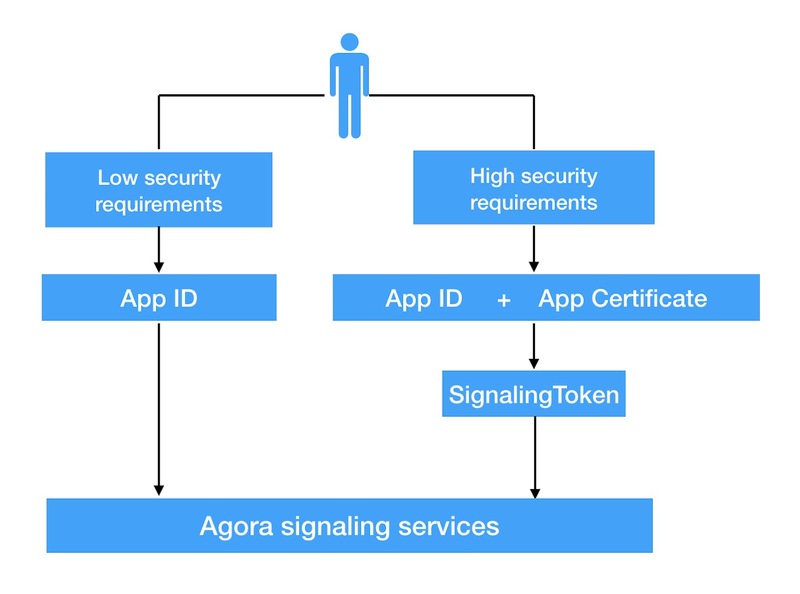 Agora recommends using a SignalingToken for added security. Each Agora account can create multiple projects, and each project has a unique App ID. Sign up for a new account at https://dashboard.agora.io/. Click Add New Project on the Projects page in Dashboard. Fill in the Project Name and click Submit. Find the App ID under the created project. Enter the App ID in the start window to enable voice or video communication in the demo. Add the App ID to the code when developing the application. Set the appId parameter as the App ID when calling the API methods. Each Agora account can create multiple projects, and each project has a unique App ID and App Certificate. You need to use both the App ID and App Certificate to generate a SignalingToken. Fill in the Project Name and click Submit. Find the App ID under the created project. Enable the App Certificate for the project. Click Edit on the top-right of the project. Click Enable to the right of the App Certificate. Read About App Certificate before confirming the operation. Click the ‘eye’ icon to view the App Certificate. You can re-click this icon to hide the App Certificate. An App Certificate is enabled for the sole purpose of generating a token and cannot be used alone. Keep the App Certificate on the server, never on any client machine. It takes about an hour for the App Certificate to take effect after it is enabled. Once the App Certificate is enabled for a project, a SignalingToken must be used. For example, before enabling the App Certificate, an App ID can be used to join a channel; but once an App Certificate is enabled, a SignalingToken must be used to join a channel. If your project integrates Agora’s Signaling SDK, you can use the Signaling Token Debugging Switch under App Certificate. If the App Certificate is not enabled, the Signaling Token Debugging Switch is disabled and you can set the SignalingToken to any value. The Signaling Token Debugging Switch is on if the App Certificate is enabled: You can set the SignalingToken or use _no_need_token to skip the setting. If you switch off the Signaling Token Debugging Switch, you can set the SignalingToken but cannot set it to _no_need_token. Otherwise, you will receive the Signaling error code 206. Version String SignalingToken version number, fixed as 1. App ID String 32 App ID provided by Agora, obtained at https://dashboard.agora.io. Authorized Timestamp Number 10 The UTC timestamp represented by the number of seconds elapsed since 1/1/1970. Indicates the exact time when a user can no longer use the Agora service (for example, when a user is forced to leave an ongoing call). account: User ID defined by the client. appId: A 32-character App ID string. appCertificate: A 32-character App Certificate string. expiredTime: The UTC timestamp indicating when a user cannot access the Agora Signaling System. token       = "1:appId:expiredTime:md5(account + appId + appCertificate + expiredTime)"
The generated token is the SignalingToken used to log in the Agora signaling system for Step 4: Use a SignalingToken. Agora provides sample code on GitHub for generating the token. The client application requests authentication from your organization’s server. The server, upon receiving the request, uses the algorithm provided by Agora to generate a SignalingToken and then passes the SignalingToken back to the client application. The SignalingToken is based on the App Certificate, App ID, User ID defined by the client, and the Authorized Timestamp. The client application calls the login method and is required to set the token parameter as the generated SignalingToken. The Agora server receives the SignalingToken, confirms that the call comes from a legitimate user, then allows the user to access the Agora Signaling System.